It's not a party without cake and no one brings the fun like Cupcake Kate! She's a colorful, fun friend that always has sweet treats on hand for her best buds! 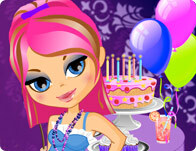 Dress her up in all sorts of crazy clothes and bright hairstyles for a one of a kind party look!